big home stores such as the great Indoors, Expo Design Center, Home Depot, and Lowe's can be good sources of remodeling inspiration as well as supplies, whether you're a do-it-yourselfer or you have a contractor. When it comes to contracting with these stores to do large renovation jobs, be careful. I heard some complaints from unhappy customers. Contractors at these stores are outsourced, not employed by the store, so find out up front how you would deal with any problems that arise. The Great Indoors, 16331 Shady Grove Rd., Gaithersburg; 240-599-1300; www.thegreatindoors.com. Expo Design Center, 7111 Westlake Ter., Bethesda, 301-767-3400; 11181-B Lee Hwy., Fairfax, 703-691-2433; www.expo.com. These two chains have enormous showrooms with kitchen and bath vignettes so you can see a range of products and how they're used. They also offer planning help as well as designer fixtures, flooring, tile, counters, semicustom cabinetry, window treatments, and accessories. The Great Indoors has a good selection of designer bedding. Lowe's (www.lowes.com) and Home Depot (www.homedepot.com), each with locations around the area, are naturals for hardware, tools, and paint (including designer lines–Ralph Lauren at Home Depot and Laura Ashley at Lowe's). It can pay to check these stores first when you're looking for lighting, window hardware, plumbing, flooring, and cabinet hardware–some items have designer, hand-crafted, or vintage looks without the high prices of specialty stores. Closet and storage shelving is also a good bet. Anichini, 800-553-5309, www.anichini.com. Luxury linens, from silk to double-weight sateens. Also pillows, throws, and embroidered panels. Anthropologie, 11500 Rockville Pike, Rockville, 301-230-6520; Tysons Galleria, 703-288-4387; www.anthropologie.com. A natural stop for first apartments. Their sheer ready-made curtains and exotic bedding can give a hip injection to the most classic decor. Atelier Draperies, 713 Sligo Ave., Silver Spring; 301-589-0362. In-home serv-ice for custom window treatments. Baldaquin, 1413 Wisconsin Ave., NW; 202-625-1600; www.baldaquin.com. High-end linens and bath products including Anichini, Porthault, and Frette. Bed Bath & Beyond (locations in Maryland and Virginia; www.bedbathandbeyond.com) and Linens 'n Things (locations in DC, Maryland, and Virginia; www.lnt.com) both carry linens at a discount and will sometimes accept each other's coupons. Getting past all the gizmos crowding the aisles can be difficult–or fun. Linens 'n Things' Web site features decorating tips as well as sizing and product guides–find out the difference between down and feathers, or thread counts, for instance. Blinds to Go (locations in Maryland and Virginia; www.blindstogo.com) has a large selection including less expensive aluminum and vinyl blinds and custom shades made in about a week. Next Day Blinds (locations in DC, Maryland, and Virginia; www.nextdayblinds.com) carries the upscale Hunter Douglas brand and its own line, Great Windows, manufactured in its Maryland factory, which makes for fast delivery. It carries specialty items such as 2L-inch wood blinds. Calico Corners, locations in DC, Maryland, and Virginia;www.calicocorners.com. Choose from 3,000 fabrics; custom bedding and window treatments available. Corrados' Custom Interior Design, 4963 Elm St., Suite 102, Bethesda; 301-951-5545. In-home or showroom service for interior design and custom window treatments. Country Curtains, Arlington Forest Center (off Rt. 50), Arlington, 703-522-7111; 167-M Jennifer Rd., Annapolis, 410-841-6843; www.countrycurtains.com. Ready-to-hang traditional curtains at good prices. Designer Workroom, 8123 Woodmont Ave., Bethesda; 301-656-4020 (by appointment only). A designer favorite, it offers in-home service for custom bedding, windows, and upholstery. Drape Rite, in-home by appointment; 301-322-2285, 703-827-8893. In business for more than 30 years, Drape Rite offers all varieties of window treatment but specializes in stage curtains–and, residentially, in electronically controlled curtains and blinds. Emissary, Tysons Galleria; 703-714-9390. Fine Italian linens such as Frette and Bellino. Florio Collection, www.floriocollection.com. Custom-made curtains in embroidered silk taffeta and linen. G Street Fabrics, Falls Church, 703-241-1700; Centreville, 703-818-8090; Rockville, 301-231-8998; Woodbridge, 703-494-5900; www.gstreetfabrics.com. Custom bedding and window treatments (by outside contractors) and a large selection of designer fabrics and trim. Garnet Hill, 800-870-3513, www.garnethill.com. This catalog specializes in all-natural fibers, such as ready-made curtains of wool tapestry and Irish linen. Hollis & Knight, 3320 M St., NW; 202-333-6999; www.hollisandknight.com. High-end furnishings and linens including the Darryl Carter furniture collection and Archipelago linens. Ikea, Potomac Mills Mall, Woodbridge, 703-494-4532; White Marsh Mall, 410-931-5400; www.ikea.com. Inexpensive linens, bath cabinetry, storage, shelving, and contemporary bedroom furniture. 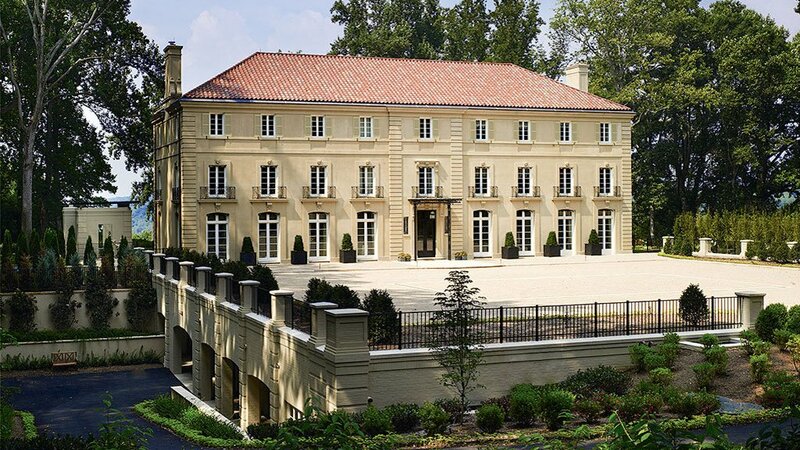 Kellogg Collection, 3424 Wisconsin Ave., NW, 202-363-6879; 10241 Old Georgetown Rd., Bethesda, 301-897-9102; 1353 Chain Bridge Rd., McLean, 703-506-0850; www.kelloggcollection.com. This local home-furnishings chain offers Jane Wilner bedding, design services, custom bedding and headboards, and unique accessories and furniture, including ladies' desks perfect for a bedroom. Persnickety, 6645 Old Dominion Dr., McLean, 703-760-8996; 10305 Old Georgetown Rd., Bethesda, 301-530-8805; www.persnickety.com. Specializes in custom curtains, midrange to upscale; it also does bedding. Having its own workroom reduces turnaround time. Restoration Hardware, Georgetown, 202-625-2771; Alexandria, 703-299-6220; Tysons Corner Center, 703-821-9655; Columbia, 410-772-8070; www.restorationhardware.com. This national chain sells vintage-looking lighting, towel bars, and other accessories. Also ready-made curtains and curtain hardware. The Silk Trading Co., 800-854-0396; www.silktrading.com. The "Drapery Out of a Box" ready-to-hang line could fool anyone into thinking it's custom. Curtains are silk, interlined, and have sophisticated pleating; they're available in about 15 styles with many fabric options. Smith + Noble; 800-560-0027; www.smithandnoble.com. This catalog offers custom-made, self-installed blinds, shades, and curtains. Urban Country, 7801 Woodmont Ave., Bethesda; 301-654-0500. Linens with hand-done touches. This home-furnishings store also offers design services. Walpole's, 60 Wisconsin Cir., Chevy Chase; 301-656-2234. Longtime source for sumptuous linens such as the Nancy Koltes line. Yves Delorme, Alexandria, 703-549-6660; McLean, 703-356-3085; Bethesda, 301-897-5009; Annapolis, 410-224-0015; www.yvesdelorme.com. Local sources for this fine linen brand. Ann Sacks Tile & Stone, 3328 M St., NW; 202-339-0840; www.annsacks.com. Beautiful high-end tile, stone, and mosaic, including glass tile. Also unusual wall and counter surfaces such as leather and metal. Atlantic Plumbing Supply, 389 E. Gude Dr., Rockville, 301-762-9696; 939 Florida Ave., NW, 202-667-6525. At the main showroom in Rockville, customers can find the full line of American Standard products plus stainless-steel sinks by Elkay and Kindred and a big selection of faucets. Atlantic discounts to the public and contractors. Beautiful Baths, Bethesda Plumbing, 11500 Schuylkill Rd., Rockville; 301-881-2400. Certified bath designer Bill Smith's work appears in magazines; the showroom has lots of ideas. Custom Made, 8432 Alban Rd., Springfield; 703-644-7155; www.custom-made-kitchens.com. This family-owned shop emphasizes its competitive pricing and free in-home estimates. Besides bathroom design and cabinetry, they do kitchens and laundry rooms. Dee David & Co., 703-560-6601 (by appointment). Certified bath designer Dee David has almost 20 years of experience in the Washington area and also teaches classes on kitchen and bath design through Fairfax County's community education program, Classes Etc. Design Solutions, 582-B Bellerive Dr., Annapolis; 410-757-6100 (by appointment); www.dsikitchens.com. A small studio owned by certified bath designer Joni Zimmerman Manto, who has won awards from the National Kitchen & Bath Association. Design Tile, 8455-B Tyco Rd., Vienna; 703-734-8211. A designer favorite for its selection of tile. F.A. McGonegal, 212 N. West St., Falls Church; 703-204-9131. Certified bath designer James Lynch is at this design-build firm. Ferguson Enterprises, locations in DC, Maryland, and Virginia; www.ferguson.com. This national chain is a designer source for fixtures, toilets, and tubs, basic to upscale. Foxcraft Design Group, 1422 N. Garfield St., Arlington; 703-524-8128. Certified bath designer Chandler Fox is the principal in this design-build firm. Gilday Design & Remodeling, 9162 Brookeville Rd., Silver Spring; 301-565-4600; www.gilday.com. Certified bath designer Ellen Gilday works at her brother's design-build firm. Haifa, Washington Design Center, 300 D St., SW; 202-484-5103; www.haifainc.com. High-priced, elegant marble, granite, and limestone. Harvey's Kitchens & Baths, 22560 Glenn Dr., Suite 115, Sterling; 703-444-0871; www.harveys-kb.com. Certified bath designers Lisa Moler Robey, who is the owner, and Kara Reinertsen have 30 years of bath experience between them. This is a full-service company, with an emphasis on design for seniors and others with special needs related to aging. Ideal Tile, Northwest DC, 202-333-5590; Chantilly, 703-968-0550; Falls Church, 703-237-8400; Laurel, 301-725-7433; Rockville, 301-984-3200; www.idealtileimporting.com. Good selection of tile, and fast installation. 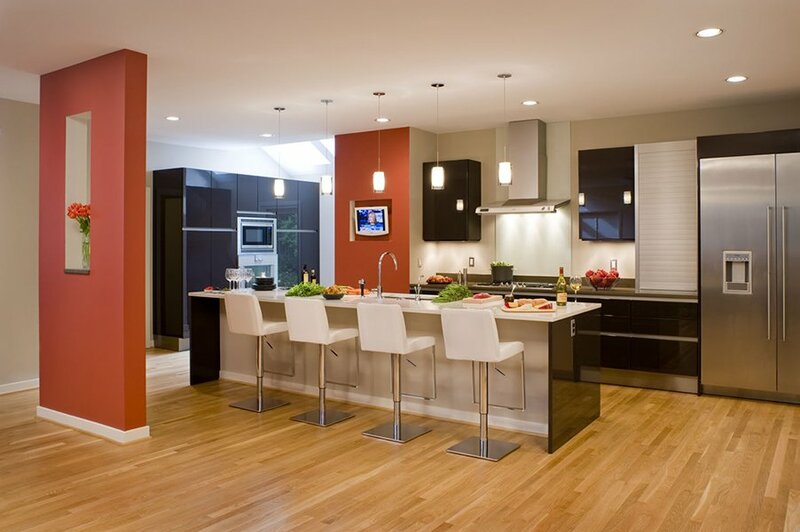 Jennifer Gilmer Kitchen & Bath, 6935 Wisconsin Ave., Chevy Chase; 301-657-2500; www.jennifergil-merkitchens.com. Certified bath designer Carolyn Thomas is praised by peers and even competitors as the best in town. Her years as a teacher at the University of Maryland might be behind her ability to communicate complex ideas. Kitchen & Bath Factory, 4624 Lee Hwy., Arlington; 703-522-7337; www.kitchenandbathfactory.com. Bath and closet design for any size space, with lots of personal attention. Kitchen, Bath & Building Design Center, Washington Design Center, 300 D St., SW; 202-646-6118; www.kitchenba-thcenter.com. More than a dozen showrooms of high-end and cutting-edge design. Unlike the rest of the Design Center, it's open to the public for purchases. If you're looking for bath ideas, don't miss Ferguson (202-646-0330) and Sherle Wagner International (202-863-3900). For cabinetry, closets, and storage, Rutt of Washington, DC (202-554-6190), Clive Christian (202-314-5700), and Wood-Mode Kitchen & Bath Design Studio (202-266-0600) offer beautiful woods. European companies are excellent at storage for small spaces: Check out Poliform Washington by Sagart Studio (202-554-8658), Studio Snaidero DC (202-484-8066), and SieMatic Corporation (202-479-7220). At the entrance to the kitchen-and-bath center, on the lower level of the Design Center, there's a display showing the work of more than 75 local interior designers. Kitchen Classics, 6023 Wilson Blvd., Arlington, 703-532-7000; and Custom Crafters, 4000 Howard Ave., Kensington, 301-493-4000; both www.customc-raftersinc.com. These companies, which share ownership, offer bath and laundry room design, storage cabinetry, and fixtures by Kohler, Grohe, and Jacuzzi. Kitchen Techniq, 12011 Nebel St., N. Bethesda; 301-231-0633; www.kitchent-echniq.com. This design-build firm, which prides itself on innovative solutions, does baths, cabinetry, and laundry rooms. Noland Co., 6607 Wilson Blvd., Falls Church; 703-241-5000. This builder has a retail Bath & Idea Center in Falls Church with products by American Standard, Delta, and others. Stuart Kitchens, 1359 Beverly Rd., McLean; 703-734-6102; www.stuartkitchens.com. Certified bath designer Judith Bracht also provides bedroom and home-office design. Wide variety of cabinetry. Tunis Kitchens & Baths, 7032 Wisconsin Ave., Chevy Chase; 301-652-5513; www.tuniskitchens.com. A longtime favorite for upscale kitchens and baths. Certified bath designer Ann Unal has created beautiful baths throughout Washington and can be especially helpful with safety issues related to aging. Union Hardware, 7800 Wisconsin Ave., Bethesda, 301-654-7810; 7505-M Leesburg Pike, Falls Church, 703-893-4444. High-end bath fixtures, tubs, and toilets by such makers as Jado and Kallista. Voell Custom Kitchens, 4788 Lee Hwy., Arlington; 703-528-1776; www.voellcustomkitchens.com. In business more than 50 years, this firm offers remodeling, plumbing, and electrical work as well as bath, laundry, and storage design and cabinetry. Waterworks, 3314 M St., NW; 202-333-7180; www.waterworks.com. This Georgetown branch of a national chain is the place to find very trendy fixtures, sinks, and tubs. W.T. Weaver & Sons, 1208 Wisconsin Ave., NW; 202-333-4200. A Georgetown institution, it carries decorative hardware and high-end fixtures. Beyond Closets, 506 Shaw Rd., Suite 325, Sterling; 703-433-1991; www.beyondclosets.com. They will design and install a closet system or let you install it yourself; showroom and in-home consultations. California Closets, 2800-A Dorr Ave., Fairfax; 703-573-9300; www.calclosets.com. This franchise, around since 1978, is so popular that "California Closet" has almost become a generic term for a closet with custom shelving. Free in-home estimates. Their Web site features lots of photos and information. Capitol Closet Design, 101 E. Holly Ave., Suite 5, Sterling; 703-406-1200; www.capitolclosets.com. Showroom and in-home service, from simple systems of melamine to wood construction with crown molding and granite-top islands. The Container Store, 1601 Rock-ville Pike, Rockville, 301-770-4800; 8508 Leesburg Pike, Tysons Corner, 703-883-2122; 2800 Clarendon Blvd., Arlington, 703-469-1560; www.containerstore.com. Bring your closet measurements and an inventory of what you need to store, and the staff will design for free an Elfa shelving system, which you can take home and install. Installation is streamlined so you should only need to drill a few holes. Hold Everything, Chevy Chase Pavilion; 202-363-7840; www.holdeverything.com. Its baskets, shelving, and closet accessories are pricey but so attractive you won't want to hide them. Perfect Closets, 603-A Loftstrand La., Rockville; 301-721-0450; www.perfectclosets.com. In-home consulting and low-pressure sales. American Institute of Architects, 1735 New York Ave., NW; 800-242-3837; www.aia.org. Doing extensive remodeling? Go to the Web site and click on "Find an Architect." American Standard, at www.americanstandard-us.com, has a Project Estimator that can give you a ballpark figure on the cost of bathroom remodeling. National Association of the Remodeling Industry, 703-442-8453; www.nari.org. The "Home Owners Guide" on NARI's Web site has advice on choosing and interviewing a contractor, a searchable database of contractors, tips on saving money, and more. National Kitchen & Bath Association, 877-652-2776; www.nkba.org. This association certifies bath designers. It will send you a free kitchen and bath workbook. On its Web site is a searchable database of designers as well as articles, frequently asked questions, tips, and project samples.